If you’re looking for a refined and relaxed destination for a summer family picnic (without leaving London), it’s hard to beat Eltham Palace. We spent a memorable afternoon there recently on a three-generational trip to celebrate G’s second birthday. As a bit of a history geek, I find Eltham Palace’s story fascinating. Once one of England’s foremost royal palaces and childhood home of Henry VIII, the palace fell out of favour and its Great Hall was even used as a cow shed before it was rescued by 20th Century socialites who transformed it into a temple of Art Deco extravagance. Phew. The present day Palace consists of the restored medieval Great Hall and the adjoining modern mansion developed by the Courtaulds. Stepping through the front door, their lavish lifestyle is immediately evident in the huge panelled entrance hall. The other reception rooms are equally striking, and the luxurious theme continues throughout the upper floor’s bedrooms and bathrooms. There are lots of activities for children, including a trail to follow and artefacts that you can handle in each room. MJ loved trying on various period costumes – medieval costumes in the great hall, World War II costumes in the basement air raid shelter, and fine furs in Virginia Courtaulds’ huge walk-in wardrobe. The highlight of the Palace for the children was discovering that the Courtaulds kept a pet lemur, which had its own bedroom and ladder to help it move between the ground and first floors. Outside there are 19 acres of beautiful gardens to explore including the former moat and an ancient bridge. For families, a new 1930s-themed adventure playground opened recently, inspired by the Courtaulds’ jet-setting travels, is also sure to be a hit with all ages. If you can persuade your children to leave the playground, the Palace has lots to see and do, but is still a manageable size for little ones. Tickets cost £13 (adults), £7.80 (children aged 5 to 16), under 5s free. 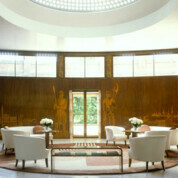 Eltham Palace is open Sunday to Thursday (Sundays only between November and February). Times vary according to the season. Babychanging facilities are available. Pushchairs have to be left in the portico outside the Palace. There is a café in the Visitor Centre, serving hot and cold drinks and light meals. There is free parking available. By train: Mottingham is the closest station.